See more in Sandee’s memory here. This synopsis tells you very little about how and why we managed to retain a friendship over 50 years. To give you some idea of that relationship, you can read a brief memoir I wrote about us just over a year ago as an exercise for my writing group: An American Friendship (click to read the PDF). In that memoir, you’ll see that I’ve mentioned my newly found sister, Vicki Sue, who was reunited with her maternal family 50 years after we were separated. That story is coming separately. However, the connection is very important because just about a year after we found Vicki Sue, we lost Sandee to her deadly battle with leukemia. But not before the two of them had the chance to meet the previous October. Although Sandee had two lovely sisters, Ronnie and Jackie, you might have thought she’d found another one of her own. (She also had two brothers–Scott, who is doing well, and Mark, who died very young of bone cancer.) Of everyone I knew, she was the most thrilled that Vicki Sue had re-entered our lives–particularly because Vicki had been raised Jewish! Sandee’s Jewish background was one of the things that had attracted me about her the most when we were young. She came from a big family–Ashkenazy on her mother’s side, Sephardic on her father’s. This mix of Russian and Spanish ancestry may be one of the primary reasons a bone-marrow donor could not be found to save Sandee’s life, despite her myriad of relatives on both sides. But my larger point is that I used to love going to Sandee’s house when we were kids because of all the people—all the life and love—I found there. My family is small and had an unhappier history, so I often took refuge in hers. I didn’t see Sandee again until August 15, 2010, just weeks before she passed. It wasn’t that I didn’t try–I emailed and called her family repeatedly trying to set up a time to visit. But she became sicker and weaker over the ensuing months and was in and out of hospitals, including Johns Hopkins–where our friend Sue and I went for our last girl-thing that August day. The three of us used to get together for our annual fall combined birthday dinner (my day is September 24, Sue’s is November 24, and Sandee’s, of course, was December 6). The last time I spoke with Sandee on the phone it was just a couple of days before my birthday, but she was too ill and too weak to realize it. On September 27, 2010, we got the word from her family that she’d passed away at the local hospital, which was her choice. She was surrounded by her loving family. Rest peacefully and as joyfully as you lived, my friend. I enclose a hug for you. How blessed is your friend, you have made a lovely tribute to her. Thank you, Kathryn, as always. Sandee had a gift for life that I’ve always lacked, which may be what drew me to her–and the number of hits on my blog today proves it! I feel her loss every day, and her husband’s grief is past the point of return, which is worrisome. Anyway, thank you for acknowledging my friend. Guess now I have to write that little piece about my sister. . . . 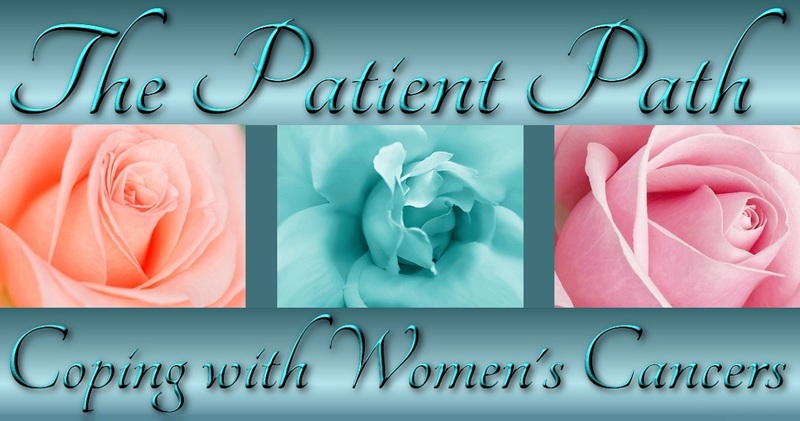 The Patient Path began in November 2013 when I was diagnosed with an aggressive form of uterine (endometrial) cancer. As a three-year survivor, my mission is to raise awareness, foster empowerment, and increase hope for life beyond cancer. Please join me and many other women with gynecologic and other cancers as we become more informed and confident healthcare consumers – as well as wiser and happier guardians of our own well-being. At Home on "The Patient Path"